Speeding up I-65 just north of Lafayette, Ind., you can’t miss the tall, white windmills in the distance. For drivers, they signal the last leg on a trip to Chicago. For others, though, the windmills mean a new source of income and energy. Less than 10 years ago, this area was just another stretch of flat farmland used to grow corn and soybeans. But since 2008, boosted by federal and local tax incentives, wind turbines like these have become an increasingly prominent part of the northern Indiana landscape. Six wind farms were completed in Indiana in 2008 and 2009 alone. Jon Thompson, vice president of Prairie View Farms Inc. in Brookston, Ind., has had 28 wind turbines on his property since he and several other farmers signed a contract with Horizon Wind Energy that year. “If we had to do it over again, we’d do it again,” Thompson said. But the coming of the wind farms has not been without concern. Opposition has cropped up around Indiana, with residents voicing fears of decreased property values, increased noise levels, and potential damage to wildlife such as bats and birds. Opponents of a wind farm planned in Delaware County, for instance, are pushing for two-mile buffers between any wind turbines and residences. That’s far greater than the 1,000-foot setback in counties like Benton. Officials in Tipton County, meanwhile, are pressing a company planning a 79-turbine farm for assurances that area property values won’t go down because of the development. And in Marshall County, commissioners recently voted unanimously to ban the building of commercial wind turbines there. Benton was the first county in Indiana to have commercial wind turbines. The county’s economic development director, Kelly Kepner, said farmers were initially asked if meter towers could be erected to evaluate wind power in the area. What the meters showed was shocking, she said. “There was a two-year study and afterward they thought the machine was broke,” Kepner said. Indiana farmland. The area surrounding Thompson’s farm in Brookston has wind speeds up to 8.5 meters per second, which is similar to the area around Chicago and Lake Michigan. Horizon approached Thompson and several other farmers in White County about leasing part of their farmland to set up turbines. White County has the second highest number of commercial wind turbines in Indiana. The group of farmers hired Bose McKinney & Evans of Indianapolis to help negotiate a contract they could all agree on. “On a farm, the only way to make more money is by working harder or by making an investment that will eventually pay out,” Thompson said. But by bringing turbines onto their land, the farmers have been able to make more money without doing either of these things. Landowners receive an annual flat fee based on a formula for allowing wind farms to install turbines, run cables or even build access roads. Because of a confidentiality agreement with Horizon, Thompson won’t discuss the rate he is paid for letting the company lease his land. But he said overall, he and the other farmers have been very pleased. Many of the turbines were built right on Thompson’s property lines, which meant that he only had to give up a small portion of tillable land. Thompson, 43, has worked on Prairie View Farms growing corn and soybeans with his parents, wife and children since they moved to the area 12 years ago. The economic recession in 2008 meant stagnant growth for many industries, but the wind energy sector saw benefits from federal stimulus program that year. Not only did companies that manufacture turbine parts start receiving sizable benefits, the incentives went so far as to grant immunity from property taxes for owners with turbines on their land. 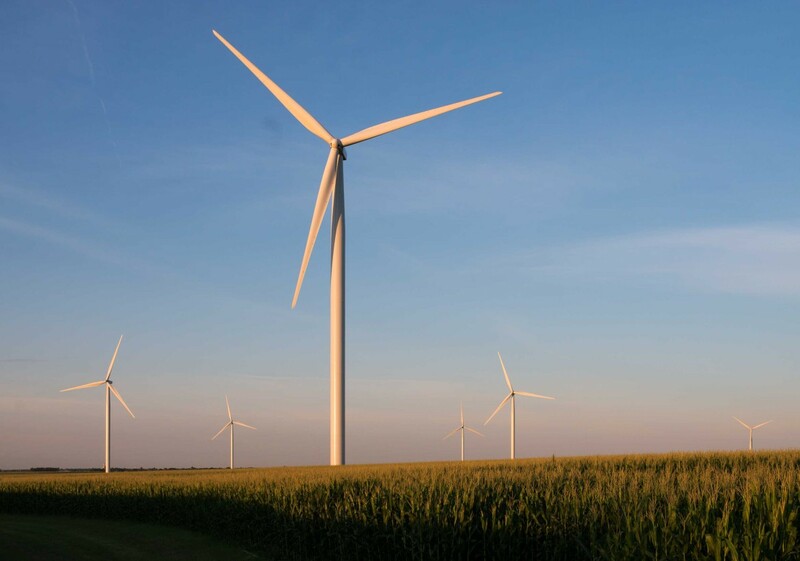 Incentives aimed specifically at wind energy include the Business Energy Investment Credit, which allows wind energy participants to write off 30 percent of their expenditures. And under the Renewable Electricity Production Tax Credit, the federal government can pay energy producers using wind turbines 2.2 cents for every kilowatt of energy produced in the first year. 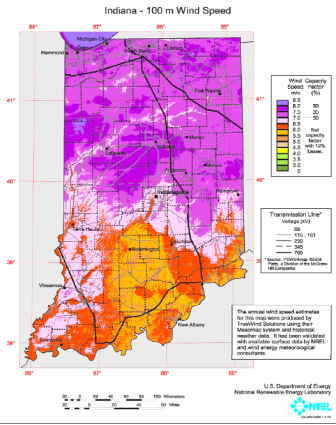 At the state level, the Indiana Renewable Energy Property Tax Exemption provided that “systems that generate energy using solar, wind, hydropower or geothermal resources… are exempt from property tax.” In 2011, the state legislature reduced that property tax incentive for large energy producers. Kepner said wind farms will continue to receive tax abatements for the next 10 years to help defray costs and encourage business growth. In Benton County, one of the Fowler Ridge Wind Farm locations in Center Township received an abatement of $358,140 for 2012 making the farm responsible for only $150,360 that year. Fowler Ridge and the Benton County Wind Farm received an average of about $70,000 in abatements per farm location last year. Indiana’s financial incentives are drawing attention from some of the world’s largest energy producers. The Meadow Lake Wind Farm, visible from I-65 near Brookston, is one of the largest in the state, comprising more than 600 turbines. Previously owned by Horizon Wind Energy LLC of Texas, the Meadow Lake farm was purchased by Spain-based EDP Renewables in 2007 for $2.15 billion. The acquisition included all of Horizon’s holdings, which extend across the country to 15 states. According to a Bloomberg News report from 2007, EDPR said it was focusing attention on the United States market because of increased competition in Europe, as well as an increasing trend in support of wind power in America. Mexia’s prediction was not far off. In the years since, EDPR has risen from the world’s sixth largest producer of wind energy to the fourth largest. According to 2012 financial statements, revenues generated from wind production in the United States now make up more than half of total revenues from all of Europe, indicating a significant shift in EDPR’s market abroad. In May of 2013 the company posted a 45 percent increase in net income for the first quarter. Brian Sullivan, an Indianapolis-based development representative for EDPR, said the company owes a great deal of its successful venture into the U.S. market to the acquisition of the Meadow Lake Wind Farm. In an interview with Reuters, EDPR officials said the average price of the energy it sold rose to 66.3 euros per megawatt-hour, which is 10 percent higher than prices in 2012. Sullivan says the Meadow Lake Wind Farm has successfully applied for Production Tax Credits and uses a tax depreciation system called the Modified Accelerated Cost Recovery System to its advantage. MARCS apply to many forms of large capital investments that include heavy equipment and machinery, including wind turbines. Despite the tax incentives, there has been minimal talk of renewable energy at the state legislature. A bill passed in 2011 calls for 10 percent of Indiana’s electricity to come from clean energy sources by 2025. However, Jesse Kharbanda, executive director at the Hoosier Environmental Council (HEC), contends that because of the nature of the law, the goal is not enforceable. Kharbanda said one problem is that there is a lot of skepticism among state legislatures about the potential benefits of wind farms. The need for the electricity that wind produces and the times when wind is at its highest blowing rate don’t always match up, according to Paul Preckel, a professor of agricultural economics at Purdue University. Wind blows the most at night when the need for electricity is the lowest and blows the least in the summer when the need for electricity is high. And because electricity isn’t directly storable, the energy being produced must be used immediately or it is lost. “Wind is not dispatchable,” Preckel said. This means that when the wind isn’t blowing, wind energy isn’t available. It fluctuates over time and it’s not possible to perfectly predict when and where wind will occur. Other skeptics of wind energy are worried about an impact on local bird populations, which Kharbanda said is an oversized concern. However, other concerns regarding noise and frequency levels have some scientific grounding, as well as support among Hoosiers. Tipton County Citizens for Responsible Development formed in response to the Wildcat Wind Farm that is currently under construction in Madison and Tipton counties. The group cited concerns with noise and frequency levels as well as a potential decrease in property values. Opposition has also sprouted up throughout the state in Tippecanoe, Whitley, Howard, and DeKalb counties. Tipton County zoning codes allow for wind turbines to be placed 1,000 feet from homes. According to the citizens group, many houses will be within one mile of up to 10 turbines, each with a blade diameter equal to that of a Boeing 747. The zoning codes are similar in Benton and White counties. In White County, where Thompson and his family live, regulations also limit the noise level of a non-commercial wind farm to 60 decibels, measured from the nearest home. “Nobody complained about where they were,” Thompson said of his fellow farmer neighbors. There are currently 120 wind turbines in White County registered under 43 different owners, according to the county surveyor’s office. The promise of wind energy has also sparked some interest among school corporations, with six schools around the state now housing turbines. “Go to any rural school and ask if they have enough funding and they’ll say no,” Thompson said. Northwestern School Corporation in Kokomo installed a 322-foot turbine last year. School officials acknowledge the initial costs are high but say in the long run, the district will realize significant savings. A less expected benefit of wind farms to some Indiana counties has included an increase in tourism. Last year about 1,000 people visited Benton County and participated in wind farm tours conceived and coordinated by Kepner. A retired teacher leads the tours, which take allows groups to see turbines up close. Groups of fewer than 20 people pay a flat fee of $75 and groups of more than 20 people must pay $5 per person. Money from the tours pays for promotional materials and improvement of the tour areas. Most travelers on I-65 likely won’t stop for a tour. For them, the growing number of windmills merely provides relief from the monotonous scenery. But for some Hoosiers, they signal a change in their lifestyles, businesses and communities for years to come. We have 30 acres we would like a wind turbine to our power and help the environment. Our house is on top of a hill, we always have wind. If this is “a closer look”, why didn’t you speak to those who are suffering in their own homes after being surrounded by industrial wind turbines? In the Wildcat I Wind Farm, several homeowners have been very vocal about the noise, which they describe as like a jet engine, and property value loss. By asking a leaseholder in Benton County about living with turbines, of course he would do it again. It is common knowledge that non-participating homeowners in Benton and White counties signed “Good Neighbor Agreements”, in which they accept payments from the wind company to not complain about the turbines. I was hoping this article would be an objective look at wind development in our state. Instead, the main focus seems to be from the developers’ points of view. So you’d rather live next to a nuclear power plant? Of course you don’t, but you expect other people to live next to it. It’s ok for other people to suffer, as long as it isn’t you. I suppose if you used zero electricity, you could complain and I would definitely side with you. But, you DO use electricity, in some amount, (I assume) so this is the price that must be paid. Thank you for speaking up and telling the TRUTH, Emily West. Industrial wind turbines are being irresponsibly sited too close to homes in Indiana, and the result is health problems for the unfortunate neighbors who had no choice but to be unwilling hosts to the wind industry. Wind turbines are about twice the height of the the turbines first erected around 2008 in Indiana, but the setbacks have no changed, and that is not safe or fair to non-participants. I actually enjoyed the standard info a person provide to your guests? I would like to know what is involved on one of your tours. We are going to the passion play in Bloomington Ill. on March 21 & april 4 and would like to add something to the tour.please reply soon . When the wind isn’t blowing, how much electricity does it take to power a windmill? the beauty of the land. I 100% agree with you but what is the alternative? nuke? oil? coal? water ? we need renewable power and yes they are ugly as heck but for the near future they are here to stay and provide farmers with much needed help with the bills as alot of farms are going under plus they add infastructer to existing power grids which are very over loaded by all the new homes and power demands such as Smithfield in Peru just did a big power line for the factory maybe if they had a turbine they wouldn’t have needed all that work? there ugly but they work just like me ? lol have a nice day. I would love to have these on my 105 acre farm.What can I do to get one for my home in Owen County Indiana. My family and I traveled for the Christmas holiday (December 2015) the weather was extremely nice and we decided to take a road trip to Northern Virginia from Illinois. Anyway, on our way back around 8 or 9 p.m. we see these hundreds and hundreds of wind mills in the background with little red light on them throughout Indiana. There were hundreds of them. My phone was not charged, so I couldn’t look it up. Anyway, now I’m reading about them. It was excitingly interesting to see all of these wind mills tall against the dark. That’s great but all I see for miles is windmills. The question is how many are there around 45 and 24 state roads. And how many more are expected. ?????? Where from Windmill.Since i am interested in all renewable energies. Great article! I am having my fifth grade students create mini wind turbines and was looking for readings they could accomplish with some assistance. I have driven by the Indiana wind farms many times and this shows how close they are to our hometown of Hilliard, Ohio. Thanks! How Many turbines were put in? I’d like to know more about what the people who live there think. I drove through last week and could not help but wonder how the people who live there think of it. I have a degree in Environmental Studies, with as much hope as the next person for this kind of work being done, something about this doesn’t ring true. What do the people living here really think? Who is to benefit in the long or short run? Will any of this be studied by Federal or State governmental EPA and how do such projects get approved? I enjoyed the scenery from both I-65 in Indiana & I-57 in Illinois. After reading about it, my interest was aroused and I read more to learn more about the challenges as well as the incentives and profits. I’m from Alabama and know nothing about Alabama laws about wind turbines and the legislative views on wind mills and wind power. However, I do desire to explore the possibility of getting involved. My husband and I just came back from a long trip from florida to chicago. We ran into these majestic wind mills farm. I think these turbines are so majestic ,surreal. I could not believe someone created such a thing, wow! omg! talk about run sentence geesh. I couldnt even continue reading! hi I have basically a old timers club and we would love to take the tour where do we make reservations? and can we maybe get a senior discount? also are there any plans for any turbines in Miami county or in Peru IN ? we could use the infastructer investment peru is dying a slow painful death like so many small tows across america please get back to me ? thank you very sincerely Gerry Maloney SR.